When I lived in Israel during the Yom Kippor War, Holocaust Memorial Day was in May. At this time there was no International Day and I believe was held mostly in synagogues. I also was unaware of the hundreds of thousands of refugees who sought haven here and elsewhere during WWII, since I was still a very young child. 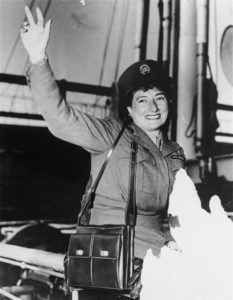 Just recently I saw a PBS special on Ruth Gruber, who’s long career as a foreign correspondent, well ahead of her time as a career woman when she was still in her twenties, wrote several books about refugees and immigrants, one of which is entitled simply, Haven, about the ship that brought nearly 1,000 refugees from Europe to the US who would have been murdered by the Nazis. It included Jews, Catholics, and other so-called “enemies” of the Reich. Photo of Ruth Gruber when she was a young foreign correspondent in 1944. Ruth accompanied these men, women, and children on the journey from Italy to the U.S. during WWII and her book is informative and moving. She offers advice, care and acts as a compassionate listener, solving problems when she can. (She was sent by U.S. Secretary of the Interior Harold Ickes.) Her writing is also excellent and gives you a sense of the trials and tribulations suffered by so many people during and after the war. With the immigrant issue still looming big, this day is a reminder that compassion is needed to help people who seek asylum. Compassion never goes out of style! 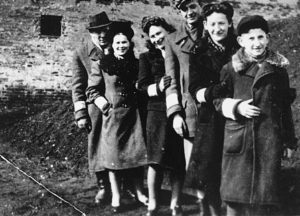 This photo is from the Home Page with the link: Introduction to the Holocaust. Go to the website to click on the link. I am unable to reproduce it here, but you can go to the site’s Home Page: https://www.ushmm.org . Join the conversation and share your reflections about International Holocaust Remembrance Day on social media using #WeRemember. On January 26 at 11 a.m. ET, the Museum will host a commemoration of International Holocaust Remembrance Day. This program will feature remarks from the Honorable David O’Sullivan, Ambassador of the European Union to the United States, and a Holocaust survivor, musical selections, as well as a candle-lighting ceremony and victims’ names reading. Join live at ushmm.org/watch. This entry was posted on Friday, January 26th, 2018 at 11:09 am	and is filed under Home Page, Leftovers / Feedback / Miscellaneous. You can follow any responses to this entry through the RSS 2.0 feed. You can skip to the end and leave a response. Pinging is currently not allowed. her and her long life. I hope she was rewarded with a good life.